Back in the 1980s and 1990s, there were half a dozen model and wargaming shops within a few miles of where I live. They often threw up odd items which might never be seen again. Like the complete range of Atlantic figures and scenarios, those useful Wild West sets with rafts and tepees and figures which just about fitted with the old Airfix stuff. Still got some of them. There were also magazines which seemed to flourish and then vanish. One small shop on the arcade sold this magazine for about five or six months in 1978. 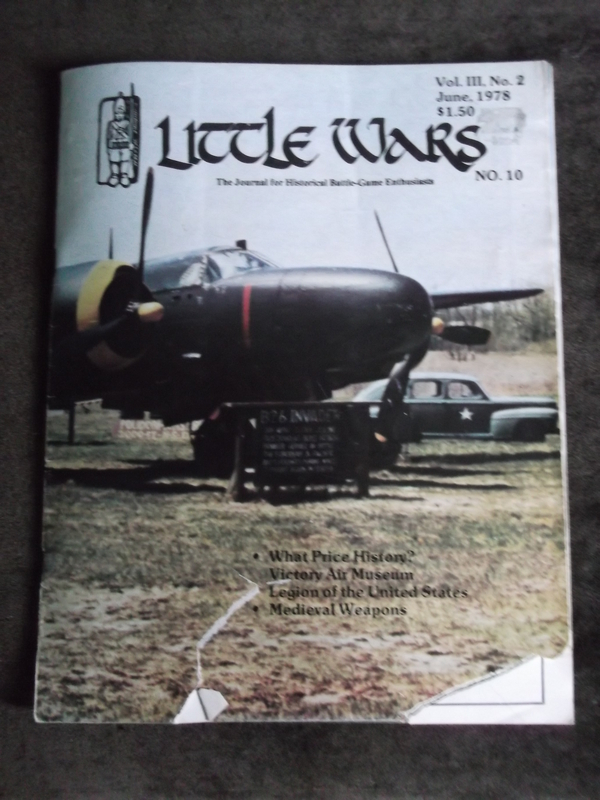 Little Wars was rather costly, selling at far more than the $1.50 US price, but I bought a couple. The magazine, rather light with only 30 pages, and more than a third of it advertising, did have some interesting short articles and brief reviews of material we simply didn’t see here. It was an entirely US-oriented publication. Any mention of UK manufacturers gave the US agent as contact. There were articles on medieval weapons, on museums like the Victory Air Museum in Illinois which was under threat of closure in 1978, articles on the ‘Legion of the United States,’ and a few battle reports. One I kept was hilarious, an OstFront scenario in which eight Panthers and four Tigers with a few a/t guns destroyed an attacking force, a table-top attacking force, of 60 T-34s and masses of infantry. In the same issue, there was a delightful analysis of the Fascist Italian command structure, which proved invaluable later on. The editor of Little Wars was Joe Orlowski, a name vaguely familiar to me from wargaming publications elsewhere, I think. I don’t know any of the other writers’ work. It was published by TSR Hobbies, and may well have survived much longer on the shelves of hobby stores in the USA than it did in this small town. Wikipedia has a very brief entry that says it was only published from 1976 to 1978 and implies that there were only 12 issues (as issue 13 was published as part of issue 22 of The Dragon). I had two issues back in the day. One had a set of micro-armor rules by John Hill that was the forerunner of the Squad Leader board game rules IIRC. According to Jon Peterson’s wonderful ‘Playing at the World’ (p.550) Little Wars was published in 1976 by TSR. TSR was then a very young company, having produced its flagship game, Dungeons & Dragons, just two years previously. TSR games had been supported by a magazine called The Strategic Review but this folded in April 1976 giving way to two successors published on alternate months: The Dragon covered fantasy themes related to D&D while its sister title, Little Wars, covered traditional wargaming. Tim Kask, editor of TSR’s house organs, billed Little Wars as ‘ a magazine for miniatures enthusiasts [that] would not neglect boardgames….covering battle reports, game analyses, book and game reviews, figure reviews…’ Peterson interprets this as competing for the same market as Strategy & Tactics but with a greater emphasis on miniatures gaming. It is an interesting piece of history – D&D was invented by wargamers, its early adopters were wargamers and indeed, many people early on saw D&D as a wargame. Here in 1976 we see the hobbies (role-playing & wargaming) diverging somewhat, along with a realisation by TSR that D&D was related to but different to wargaming and that there were two distinct audiences emerging.